The journalist and filmmaker Chai Jing 柴静 left her position at CNTV in 2014 to devote herself to producing a detailed documentary about air pollution in China at her own expense. 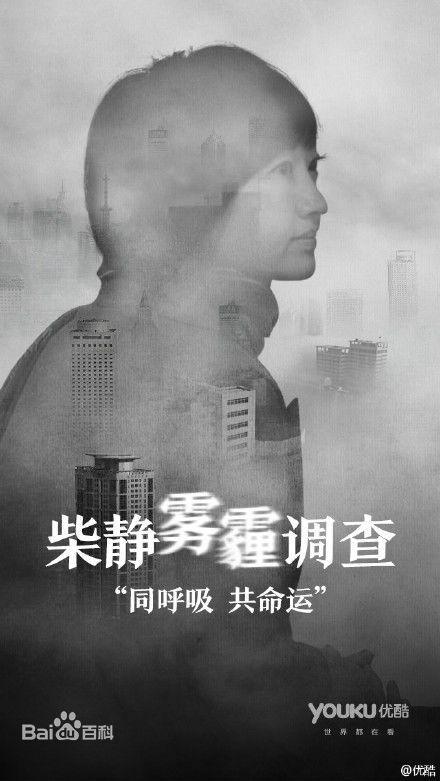 This remarkable film, “Under the Dome: We Breath together and share a common fate” (Qiongding zhi xia: Tong huxi gong mingyun 穹顶之下 同呼吸共命运) presents a blunt and brutal assessment of the tremendous impact of air pollution on China today and its far-reaching implications for health and for society and culture as a whole. When I watched the documentary, I was struck by the careful explanation of scientific and geological aspects of air pollution and the discussion of the impact of coal and other pollutants on the atmosphere. The comparisons with other nations were also striking, suggesting a truly new sense of China’s role in the world. The film opens with Chai Jing showing an ultrasound picture of her daughter before she was born and relating her expectations. Her daughter was born with a lung tumor. The film closes with a view of the earth from outer space suggesting just how small this globe it. Chai Jing imagines that although she might die and leave this world, her child would still be there on earth. The implication being that we cannot assume that just because we may avoid climate change, that our children will. Or more importantly, that we share our earth with future generations we have not met. “Yesterday the hottest news on Chinese media was an documentary on the environment made and sponsored independently by a well-known woman journalist. She conducted remarkable in-depth research about the smog that is engulfing China. Some of the issues touched on such as governance and inefficiency in the energy industry were previously considered so sensitive that noone would dare to expose them. But with Xi Jinping’s anti-corruption campaign in full swing these days the whole story has come out. The video has been re-tweeted over 30 million times, and more, and it is being discussed everywhere in the country. This is the first time I came to feel a strong civic common sense—such as I’ve never experienced before, at least in China. I expect this film can have as much impact as the Rachel Carson’s book “Silent Spring” did for the United States now in my country. It is a very exciting moment to see such enthusiasm, but not a moment too soon. I have seen such devotion among the members of Future Forest 未来林 in the past and it has inspired me. For me it feels like this might be the first step towards China playing a true leadership role. And in an odd sense, I think this marks the end of the Cultural Revolution legacy. You see during the Cultural Revolution (1966-1975) many deeply idealistic young Chinese strove to serve society. Some went down to the country to help poor farmers and others held campaigns to criticize what they thought were unfair practices in China. Unfortunately, many of their naïve efforts were abused by politicians for other purposes so that by the end of the Cultural Revolution there was deep disillusionment in China. Idealism and work for society seemed foolish and useless. That crisis led to forty years of pragmatism and the pursuit of wealth and power. But perhaps with the release of “Under the Dome” we are seeing a return of idealism and a concern for something more than oneself in China. One thing is certain: Unless we change our thinking, we cannot address the environmental crisis. It is not a matter of technology or policy, although both those issues are part of the solution. It is a matter of human desire.